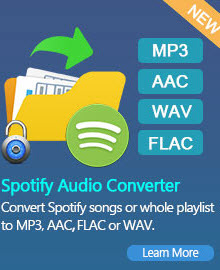 Any Video Converter - Convert MP3, WAV, WMA and All Other Audio Formats! Any Video Converter is the best MP3 Converter to convert your video to a wide range of formats like AVI, MKV, MP4, WMV, MOV,MPEG, 3GP, ASF, FLV, VOB, WMA and MP3. With this MP3 Converter, you could convert video to almost all kinds of video formats for playing on various multimedia players such as iPad, iPod, iPhone, Apple TV, PSP, PS3, Xbox, BlackBerry, Creative Zen, Android phones, Windows phones and more mobile devices. Any Video Converter is an all-in-one MP3 Converter, Video Converter, YouTube Downloader, DVD Burner and video editor beyond your imagination. It is easy to use with fast converting speed and excellent video quality. 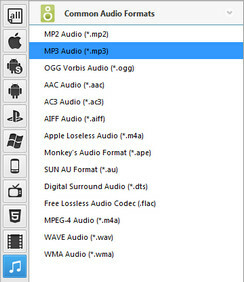 AVCLabs Any DVD Converter is powerful mp3 converter software that simplifies the conversion process without compromising features or flexibility. Are you in the need to convert your DRM audio files to MP3? Try this great DRM Audio to MP3 Converter for free. If you are running Mac system, you can get Mac version for this MP3 Converter -- Any Video Converter Ultimate for Mac. It is the best video converter to converts video file formats between AVI, MP4, MOV, MPEG, 3GP, ASF, FLV etc you desired. So it will performs the best avi converter, 3gp converter, mp4 converter for Mac users and so on. Besides, it also features the functions as Video Converter, DVD Ripper, DVD Creator, YouTube Downloader, Screen Recorder, iPod Manager, Video Editor and Audio Extractor. Step One: Please download and install Any Video Converter. Then run this MP3 Converter. Step Two: Click Output Profile, unfold Common Audio Formats from the drop-down list and choose a proper format such as mp3, ogg, aac, wav, m4a or wma. Step Three: Click Convert button to start converting to mp3 in batch. If you want to stop the process, please click Stop button to halt the encoding. And please click "Output Folder" at the bottom left corner after that the file convert completely. You could click: Options > General to Set Output Folder as you like. Step Four: If you want to use this MP3 Converter to convert YouTube video to mp3, you can click "Download" button to add the YouTube video URL. Or you can copy a YouTube video URL and right-click on the middle panel of the program to paste the link, or use Ctrl+V. Google video and Nico video are also supported. You can also specify YouTube video quality according to your need. This MP3 Converter supports mobile version (3GP), standard (FLV), high quality (mp4) and HD videos (HD mp4) from YouTube. Click Options button and go to Online Video tab to set YouTube video quality. This MP3 Converter is also YouTube video downloader and YouTube video converter. It is very easy to download to your hard drive and convert YouTube Video to MP3 with the built-in YouTube video downloader and YouTube video converter. Besides convert MP3 Converter, MP3 Converter can do more works for you. Converting YouTube to MP3 is one of the abundant features of MP3 Converter. With this powerful MP3 Converter, you can convert FLV videos downloaded from YouTube to MP3 for your MP3 player. What’s more, MP3 Converter has a built-in YouTube Downloader that can automatically download and convert YouTube videos to the mp3 you specify. Besides converting various types of video formats to MP3, this MP3 Converter can also convert videos to many video formats. It can convert videos to MPEG-1, MPEG-2 and MPEG-4, FLV, AVI, 3GP, DVD videos, and MP3. If you got iPod, PSP, iPhone, Apple TV and other devices that support MP4, you can use this MP3 Converter to convert your videos to MP4 format. If you got mobile phones, probably you would like to convert it to AVI or 3GP videos. And this MP3 Converter can do that. Because iTunes M4P is a kind of encoded audio file format which is inserted with DRM protection to limit to play M4P files on other players or devices like MP3 player. So if you have M4P files, especially the files you purchased from 2003-2009, and you want to convert them to MP3. iTunes DRM Audio Converter. 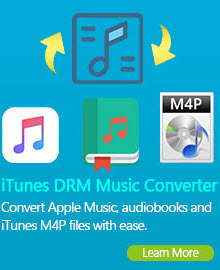 is a good choice to help you remove the DRM from iTunes M4P files which you purchased before and convert them to MP3 format you want.